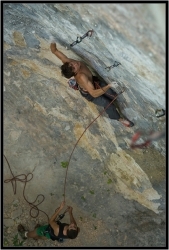 Sergey did the route "HARRY" 8c/c+, first ascent. 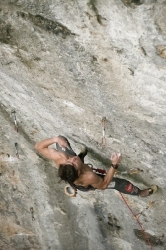 This route is first 8c/c+ in Russia. 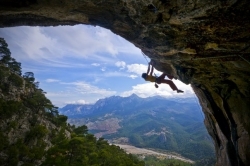 Climbing region Guamka is located in south of Russia in Krasnodar area. 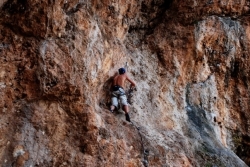 Guamka has more 150 climbing routes. 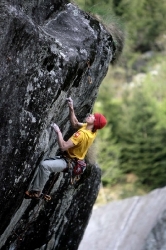 There is International Festival of rock climbing every year. VIDEO of ascent the route "Harry"
Discription of Guamka region in Rnglish. 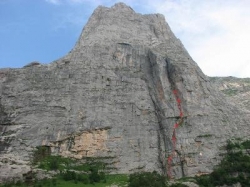 In April 2010 Sergey climbed the new route in Val Masino (Italy) named "Vibrazioni squilibrate" and give the category 8c+/9a. This route wait the repeate and confirmation this category. 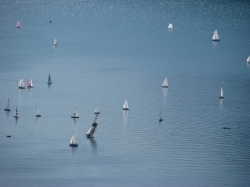 2009, October. 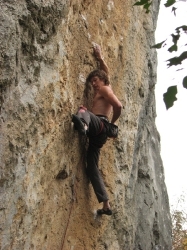 Ascent of Gullich 8c+ (Crimea). In September Sergey came back to Italy for working like trener with russian group in Arco and for climbing new project in Val Masino after that. Trip to mount Fisht in Krasnodarski krai, Russia. Sergey and Maksim made a new multipitch route to wall of Fisht. 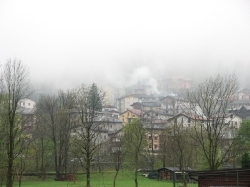 Val Masino and Val di Mello valleys: prepare the Melloblocco festival and make 3 ascents of the routes 8c!